Republicans in the state of New York met for a planning session in Albany on Tuesday in advance of the 2018 campaigns, which will begin shortly. 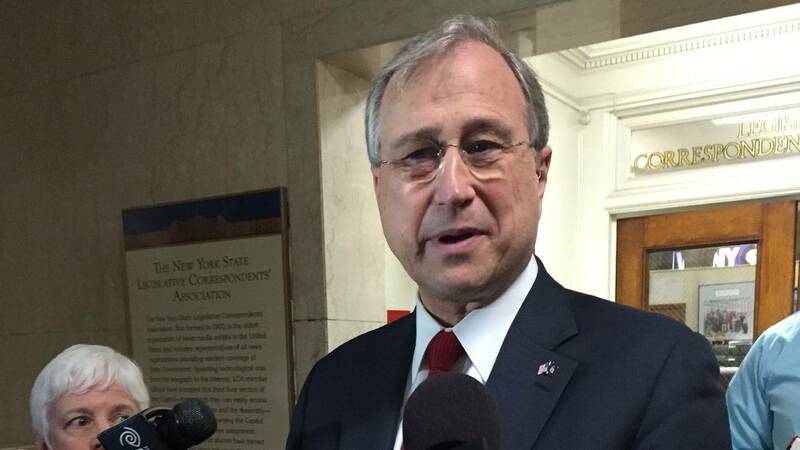 The party’s leader, Ed Cox, believes Republicans have a good chance at winning statewide office against Governor Cuomo and others next year. Republicans in New York face a daunting challenge in the race for Governor next year. There are fewer GOP voters than ever, as the number of Republicans shrinks and Democratic ranks grow. President Trump, the head of the Republican Party, is widely unpopular in New York. And the GOP does not have the funding currently to match the $25 million dollar campaign war chest of Andrew Cuomo, who’s said he’ll likely seek a third term in office. Nevertheless, GOP Chair Ed Cox believes Cuomo is vulnerable, despite the governor’s near-universal name recognition among voters. Cox says Cuomo made a mistake when he banned hydrofracking in New York, and he says the Nanotech industry has faltered with the indictment of its former leader, Alain Kaloyeros, along with eight other former Cuomo associates. And he says Cuomo let the New York City subways deteriorate while he instead focused on a synchronized music and light show on the city’s bridges. Cox says it shows in recent public opinion polls, where he says Cuomo’s job approval rating is in the low 40's. Governor Cuomo has not said that he’s running for President in 2020, though his name is frequently mentioned as a potential candidate. Cox predicts that if the Republicans come up with a good candidate, he expects money to follow from groups including the Republican Governor’s Association. In 2014 the RGA was chaired by New Jersey Governor Chris Christie, a Cuomo ally who withheld funds from the 2014 GOP gubernatorial candidate Rob Astorino. Christie is no longer chair of the RGA. Potential candidates include Assembly Minority Leader Brian Kolb, Syracuse State Senator John DeFrancisco, and businessman Harry Wilson. Wilson, who is independently wealthy, says he’s still thinking about the race. But he says if he does, his entrepreneur background would be an asset. “I’ve spent a career fixing broken organizations,” said Wilson who said he’s helped save jobs and help businesses “turn around and flourish”. Wilson says if he were to run, he would contribute a substantial sum of his own money to the cause. The head of New York’s Democratic Party, Basil Smikle, defended Cuomo’s record, saying the governor has enacted a number of popular progressive programs, including the $15 minimum wage, the “strongest” paid family leave and gun control laws in the nation, raising the age of criminal responsibility from 16 to 18, and enacting a free college tuition program for some middle-class families. Smikle also took some personal shots at Cox, who is also the son in law of the late President Richard Nixon, calling him an “unregistered fracking lobbyist”, because Cox owns shares in a natural gas drilling company. And Smikle says Cox is aligned with President Trump. “He’s Donald Trump’s top cheerleader in the state,” said Smikle, who accused Cox of tolerating corruption under former State Senate Leader Dean Skelos, who now faces prison time for his crimes. GOP Chair Cox says Republicans need to win the governor’s office if they hope to retain control of the State Senate, where the GOP rules with the help of some independent democrats. He says he doubts that the majority of New Yorkers would really like to see a one-party state controlled solely by Democrats.